Updated from these instructions. Why moving from GoDaddy to Google? 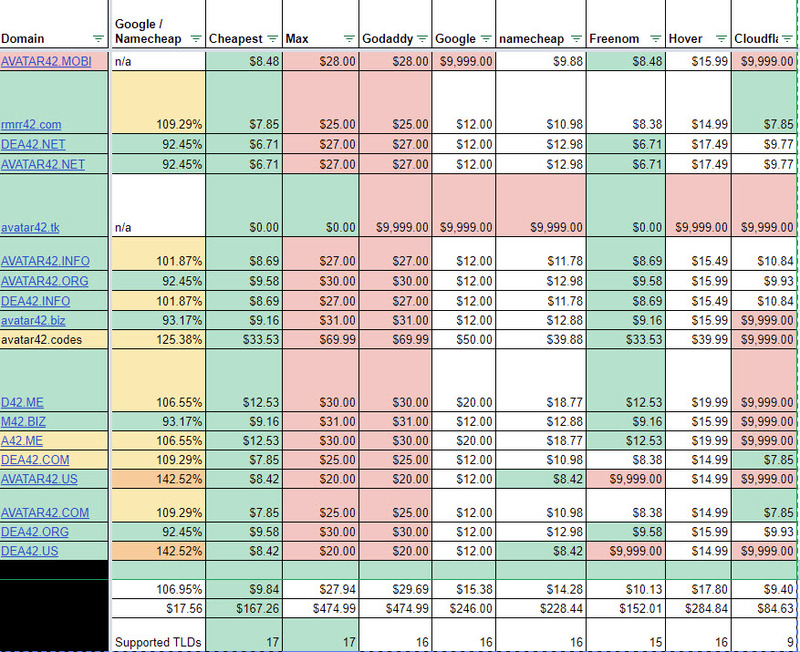 See price comparison. 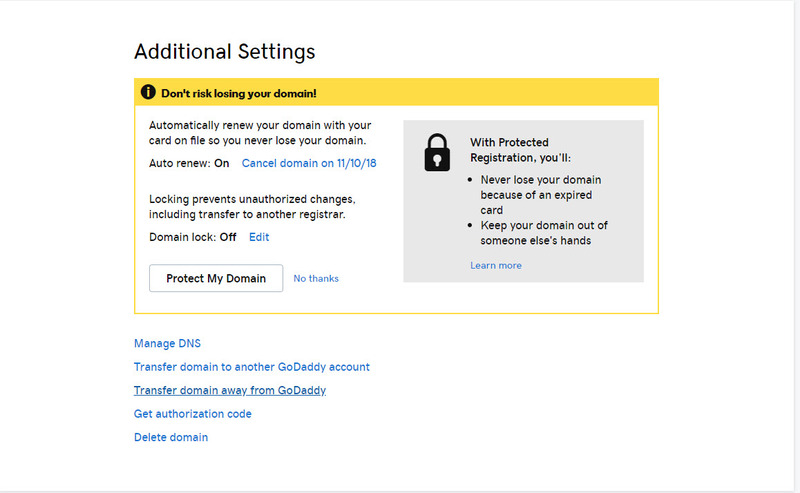 Go to the Godaddy domain manager. 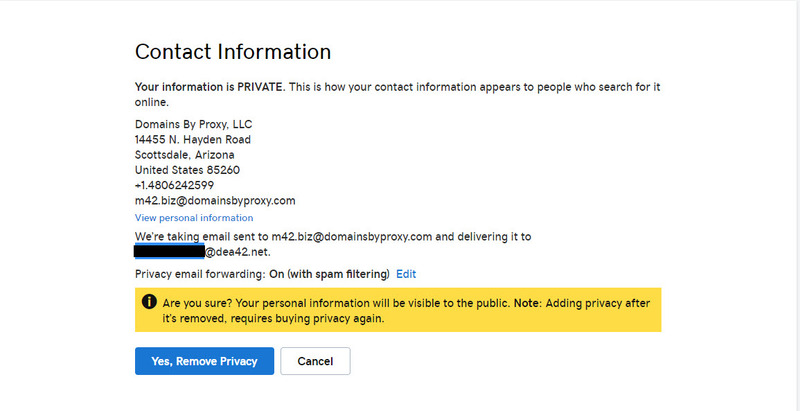 Click on the domain name and remove privacy. Note before removing check that the email is valid and working. Scroll to the bottom again and fill out form. Note the most popular options are oddly not in the drop down choices of where you are going to. This may take awhile. You should get an email when done. Note too GoDaddy seems to give you a blank screen when you try and go back to the domain list to do the next one. You might need to go back to products page then select Manage button on the next domain to transfer the next one. That gets you to a page to enter the code GoDaddy emailed you. You probably want to use their nameservers. Click continue And they will confirm you want privacy ans tell you the price. 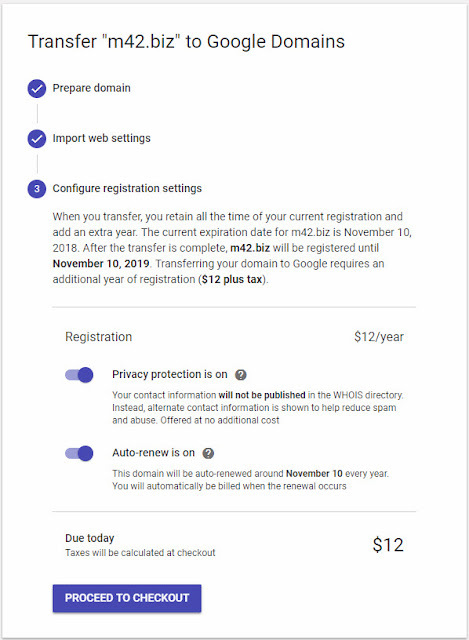 Note your $12 on Goggle includes privacy unlike GoDaddy where a .biz is $21 for the domain PLUS $10 for privacy. Pay on the next screen. Then back to the transfer page where this domain has been added to list looking like this. Note that is says it could be a week before it is truly final and may require a confirmation to and email so keep an eye on it. 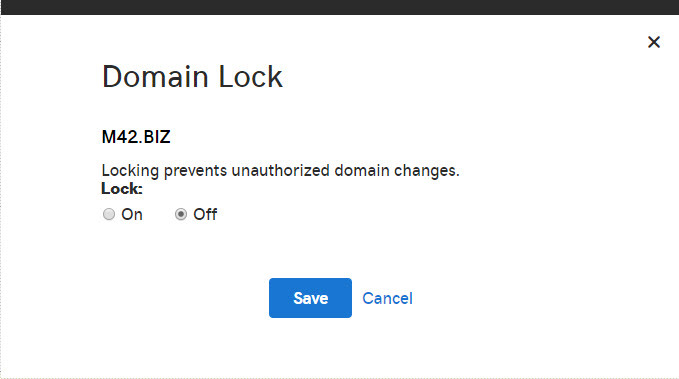 Once the process is done it is a good idea to double check your DNS entries to make sure nothing got lost or changed along the way. Obviously registering them on the cheapest for each could save you some and Namecheap's average cost (3rd from bottom) and total cost (2nd from bottom) is a bit cheaper than Google but given the yearly diff is less than $20 and I like Google's management tools better it seems worth it just to have everything in together at Google. Well my Mokacam 360 FINALLY showed up over a year after the scheduled ship date. Still waiting for the accessory kit as of 5/14/2018. 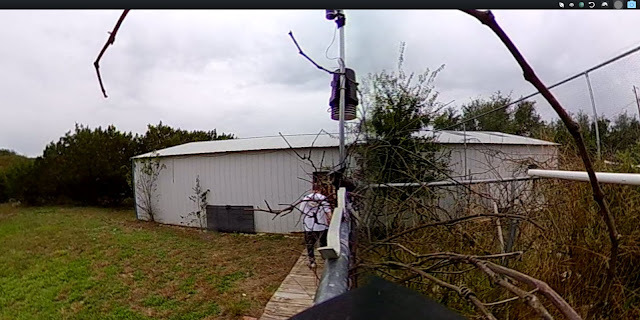 It also appears to be a Vivitar DVR988-BLK 360 Action Camera, which is getting equally bad reviews. with a metal plate front and back to cover it. Maybe to hid the name? The Vivitar is the same price and also claims to be high rez but only does video at 960p. This pic gives you an idea of the quality. Note stills are 3008 by 1504. You even have to convert the video and pictures so anything sees them as 360 after getting them off the camera. 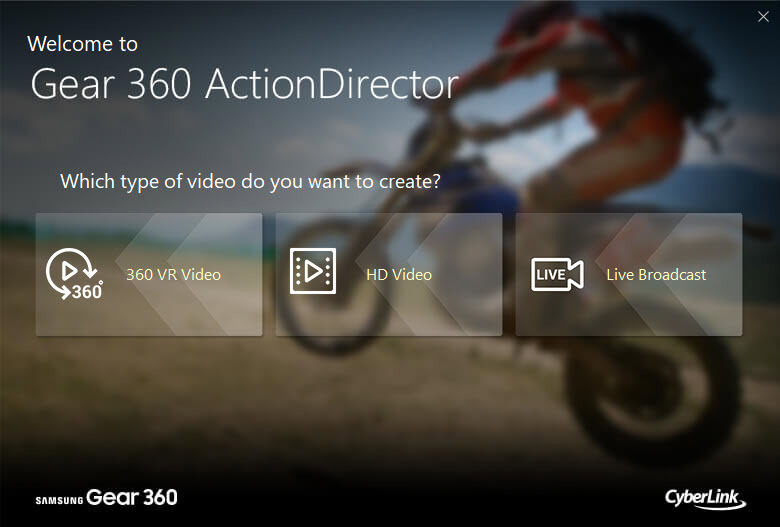 Note you still need 360 support to view them as 360 so this does not appear as 360 here. 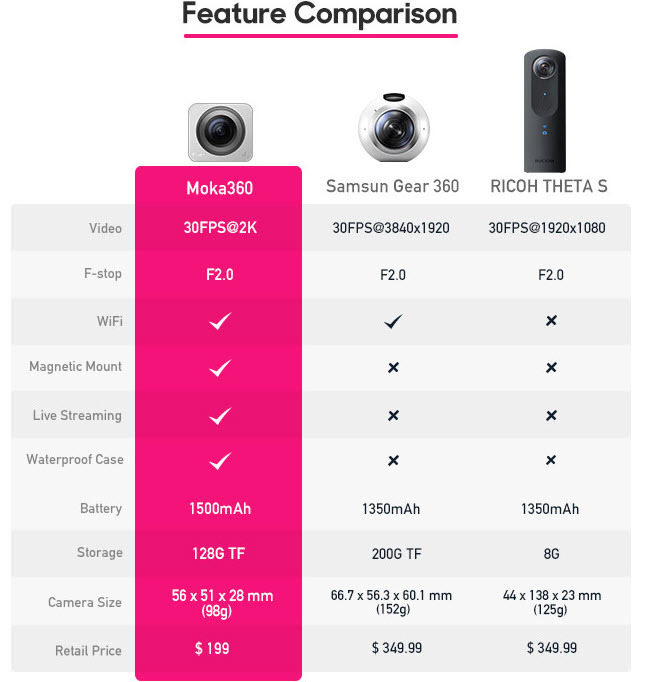 The Mokacam 360 is a disappointment on many levels. First off it was over a year late shipping. When it did get here the app did not work at all. Fortunately the Vivitar app does though it seems to lose connection a lot even a couple feet from the camera. 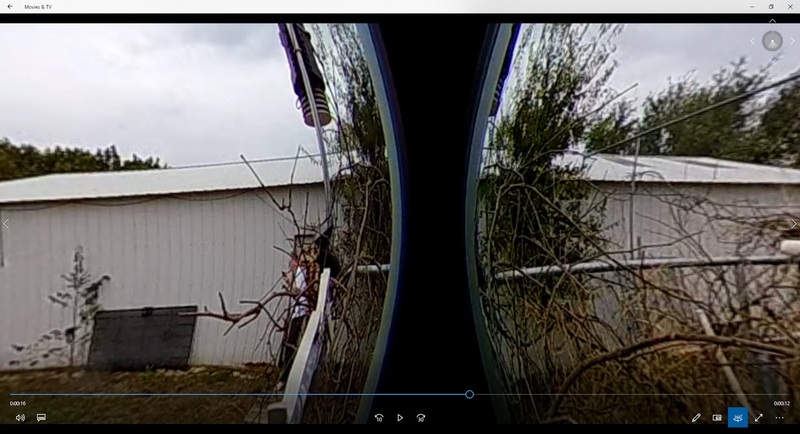 The video is really poor but then it is only doing 960 X 960 on each lens despite it obviously having 1504 x 1504 sensors. I can only imagine for image stabilization though there is not mention of this. But it you think about it there really is not much you can do with that low of resolution. This is a nice explanation of relative resolutions Now think about your average cheap 720p (1280x720) security cam that has a horizontal viewing angle of around 70 degrees and you still can not really make out anything of any distance on them. They are OK on a small screen and for seeing things close, like a Ring Doorbell for instance. That is 1280 pixels over 70 degrees or about 18 pixels per degree. This is 960 pixels over more than 180 degrees so you are talking 4 to 5 pixels per degree. 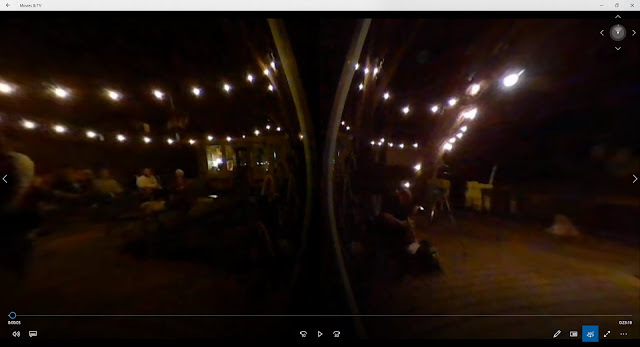 So just to match the video quality of that cheap 720p camera you really need 3240 x 3240 pixels. 4K will get you there on the horizontal but not the vertical. And that is just one side. You really need about 12K video to pull off the same level of quality in full 360 x 360 you would get from 720p. Note on their Indiegogo page they claim 30fps@2K and infer that is the same as the Samsung Gear 360 but it is not. Note too the Samsung Gear 360 (2017 Edition) Real 360° 4K VR Camera (US Version with Warranty) has an MSRP of $229, is going for $89 with one day free shipping (on 10/22/2018) and the price seems to be on a downward trend. 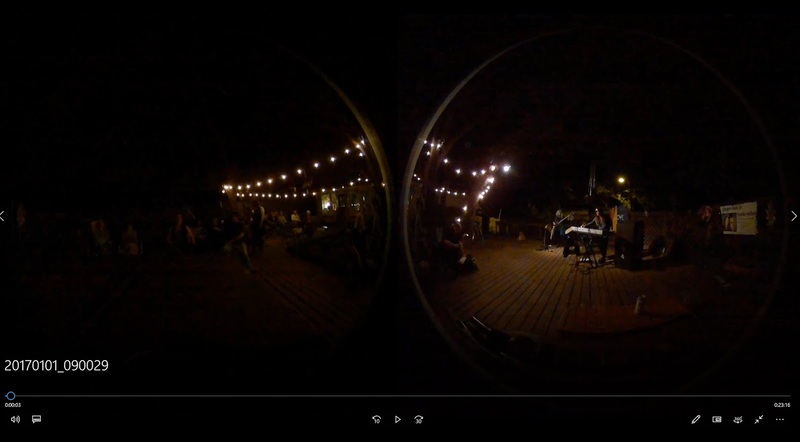 The reported record resolution for the Samsung is 4096x2048 @ 24fps 360° Video/15MP 360° pictures. Just goes to show how shipping late blows your market. There is also the GoPro Fusion — 360 Waterproof Digital VR Camera with Spherical 5.2K HD Video 18MP Photos which sounds like it is a bit better but at $600 it might not be worth it. You also might want to look at this page for other options. I did get my accessory pack a week or so later and managed to get a quick test video done on the 3rd try that was stitched correctly but then forgot how I did it when I had some show footage to try it on. (See further on.) So I left this post on hold. I used the Mokacam 360 again at a show a couple weeks ago and thought I'd take another shot at it. The post: Anyone ever got this thing to record in higher than 1920 by 960? Or found any settings other that record mode? Checked site for new firmware but there appears to be apps, firmware and manual for only one of their 4 models and this cam is not it. Only other thing on support page is “Forum under maintenance”. Website is so painfully slow it appears to be on the verge of crashing. 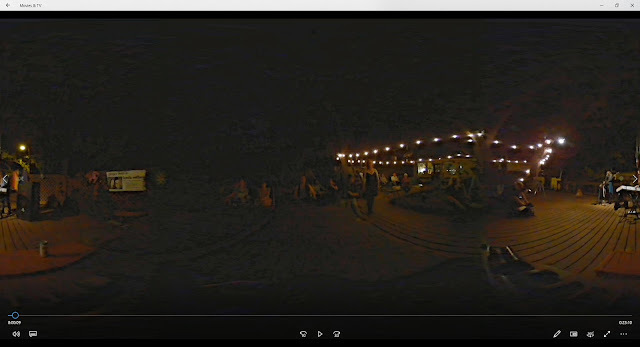 Of the 2 Mokacam apps in the Google store only one sees the camera and it says it is the wrong one for the camera. 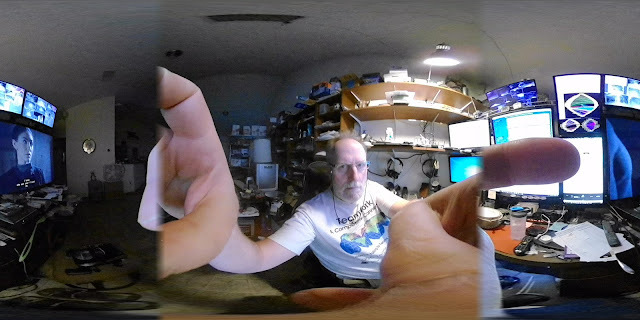 Still searching around in frustration I stumbled upon the Mokacam 360 Windows app I must have downloaded at some point (which appears to no longer be available anywhere and is probably why I was getting nowhere). If I view the video and pics in that app they look OK. 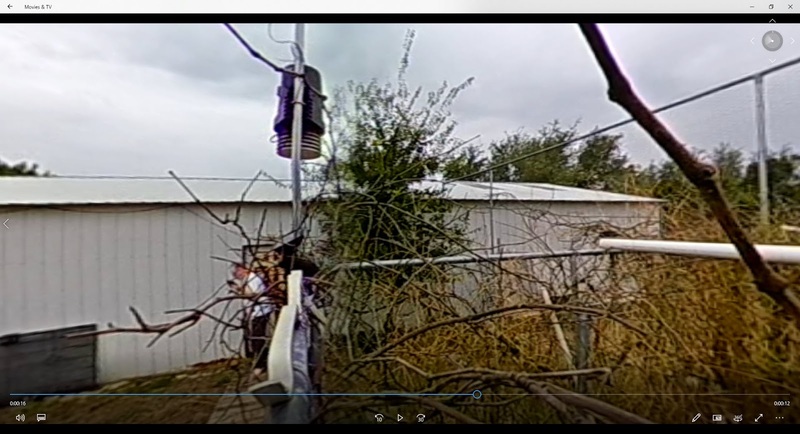 This made think about a comment I made above in May about needing to convert the video, despite the Indiegogo page saying this is done in camera with no post processing needed. Sort of hidden in this no longer available player app is the needed converter. The icon is a pair of scissors cutting film down in the lower left. When you click on that you get this. Click on these links to see the raw and converted videos these pics were taken from. In Mokacam 360 player in the default mode (Saturn like icon) it looks like this. Not real useful but some people seem to like it. In 360 mode you get this. Funny the stitching is best at a distance yet the lot many of these cameras the best focus is within a few feet. 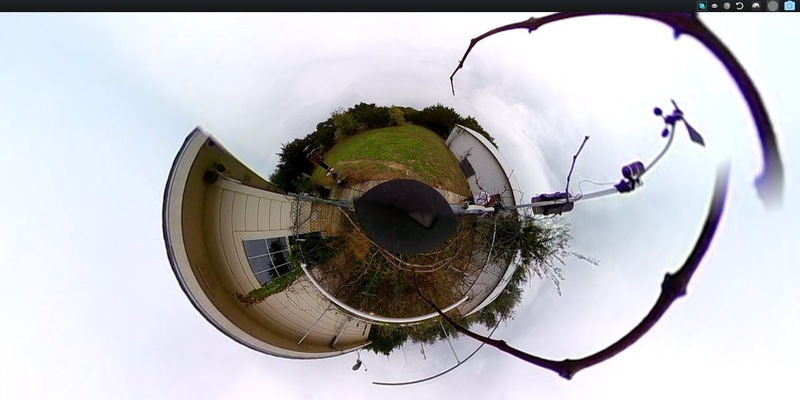 But you can zoom in world view (unlike 360 view). At max zoom it looks like this. 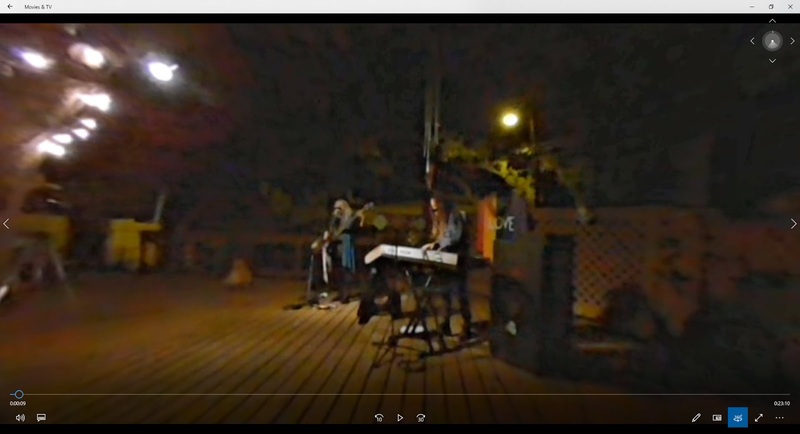 After converting the video it looks even more zoomed like this in Windows Movie & TV app even though zoom no longer works. 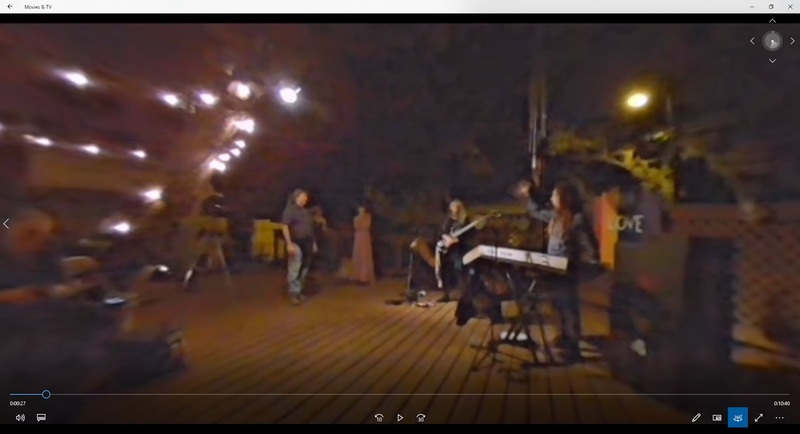 Note this added zoom also tends to make the video look more blurry and pixelated. Doing the conversion takes about as long as playing the file even on my heavy duty workstation and the output is dubious. There appears to be a merge option but the camera drops frames. As in a full one to two seconds lost between clips. So you will want to do them one at a time. Manually as there seems to be no batch convert mode. 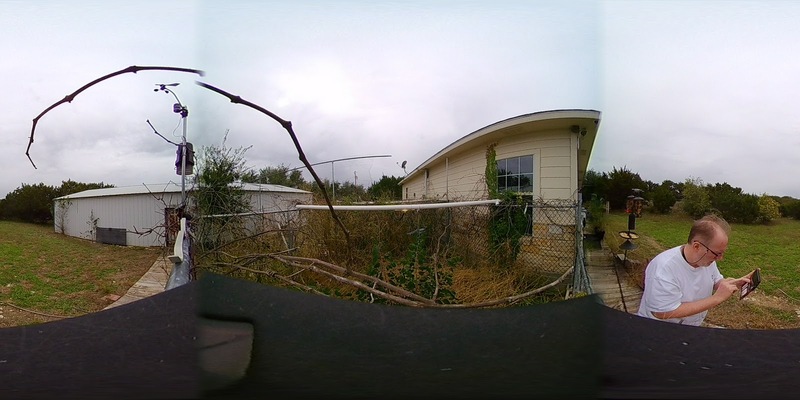 Note even my Canon G30 drops the occasional frame but this is up there with my junky Crosstour 4K Go Pro clone. 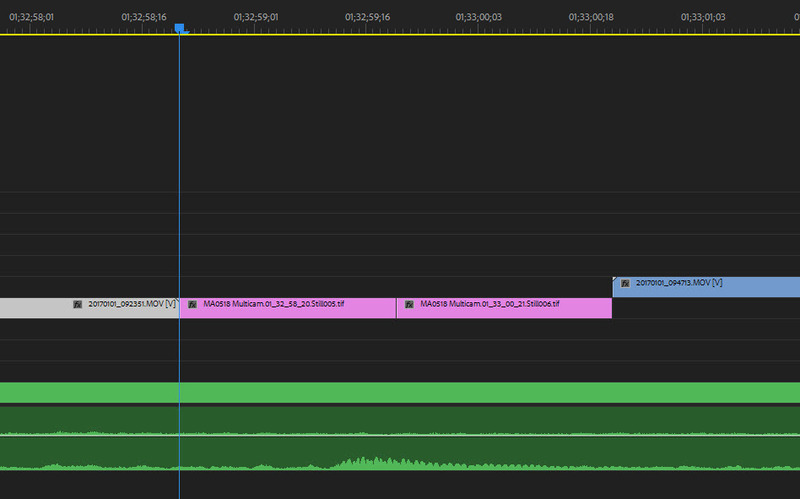 Here is a shot of my timeline with screen grabs (in violet) filling the missing frames between two clips of a "continuous record". Click on these links to see the raw and converted videos the below pics were taken from. To compare with the Kodak PIXPRO SP360 4K Dual Pro Pack VR Camera see my samples from that camera in this playlist. Basically it stretches out the circles to fill the frame so the less than 960 x 960 pixel circular is down rezed even more. Now when viewed in 360 / VR mode it looks REAL low rez. See what I mean about the added zoom making thing worse? If you want to edit this in Premiere CC Pro here is how. select the audio track first. (If audio is more than one file make a sequence from the parts first then use that as the audio.) Create multicam sequence by selecting sync on audio, then all the video clips, right click and select create multicam. Make other adjustments as needed to center and align default view on subject. Again this final rendering is very slow. 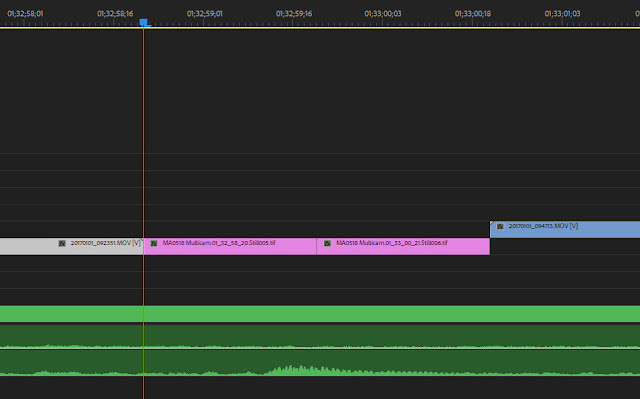 The 11 minute video above took about 8 hours to render. 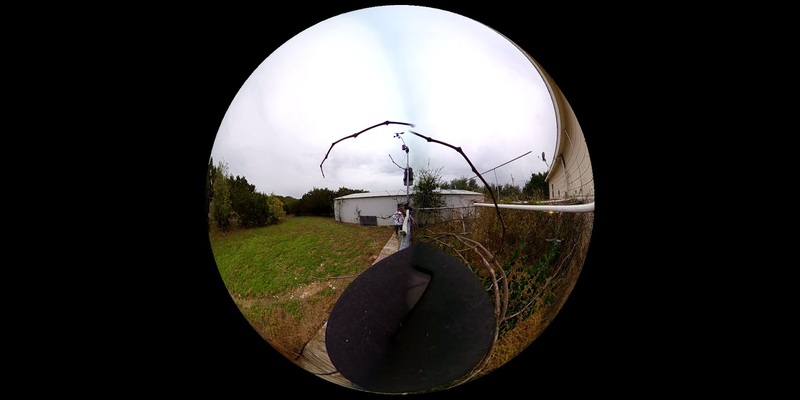 You will notice neither seems to be viewing as a 360 picture. For that you have to upload the converted picture to a site like Flikr. Click here to see the converted and the raw pictures on Flikr. The way it seems most think the main reason most are on Facebook is everyone is on Facebook. Once something "better" gains some market share people will just shift their time there.Not remove their accounts just stop checking and updating them. Just like when people "moved" from MySpace to Facebook. That just has just been the way of the internet. It is not a question if Facebook will go away. Yahoo Groups is still around for example and that was way pre MySpace. For that matter Match is still around after being sold to almost everyone at some point and that goes back to before the internet to the BBS days. Once you get to a certain point it seems like there is always funding to keep going. The questions are, where will be the next place the most people spend most of their time and when will it be recognized as THE place to be? LiveJournal was getting traction for a bit there but the whole being Russian based thing kind of killed that. Currently I'm hearing of people going to MeWe though so far it seems to have less users than Google Plus. MeWe is basically just Facebook profiles, messenger and groups without ads. They hope to get you pay for upgrades over the free services to pay the bills. Seems to be just people and groups. No fan pages means no companies though and that might be their down fall since people seem to like that they are often heard by companies when complaining about them on Twitter or Facebook. Not to mention that kind of leaves out artists too. Though I guess you could sort get around that with a group based on the artist(s). Also it does not seem have an API or to work with anything yet. So for instance if you post to Twitter you can't get it to post to your MeWe account too. That is what mainly kept Google Plus from taking off so again it might be deal breaker for many. But then there is no real reason they can not add these features if enough ask for them. My personal feeling is it is almost impossible for anyone starting out to compete with Facebook at their level of features but people are getting REAL fed up too so things will probably fragment for awhile. Using one site for this and another for that. For instance, getting family and groups to move to MeWe or similar leaving Facebook increasingly more just companies and artists kind of like what happened to MySpace. Then at some point some one will start adding features to head back to doing what Facebook does. For the most part. I'm guessing with freemium business model similar to MeWe's as that seems to be the industry trend now. I'm actually kind of amazed Amazon.com has not jumped in here yet. Selling you stuff is getting to be less and less of their business They run the cloud for a good chunk of the internet already and they have already seen the future in streaming. While most content providers are increasing pulling their content to exclusive sites Amazon started partnering with them to give users one place to view, search and pay for them all. Not to mention their push into automation. Note MeWe is hosted in the AWS cloud. Not much has changed other than Google announcing it is giving up on Google + and Facebook stopped letting IFTTT post account status updates. You can still post to pages for now at least. (Note only one page per IFTTT account. To post to multiple Facebook pages requires multiple IFTTT accounts.) The overall feel now though is that Facebook will end up being your only real choice and it will probably lose features you use now and gain some you do not want like the Portal which seems to confirm the rumors about Facebook that worry the most people. That it is trying to monitor you 24/7. Not just track your web usage but listen to your conversations and with the Portal even literally watch you. First I started syncing up some stuff to the cloud and other stuff to USB drives. But that did not protect from much other than drive failure. So I added Carbonite which kept getting messed up causing me to start the upload to the cloud over from scratch. It was also uploading so slow that it never seemed to finish. At the time it did not support USB drives or network mounted drives. The only real plus was it linked straight into Windows Explorer making it easy to select and unselect what got uploaded to the cloud. So I did a bit more research added Crashplan Home which let me back up stuff from several Windows and Linux servers to a 16 TB Linux box in the shop and the cloud. Technically I could back up everything to the cloud but only did a subset given the time involved. It did not care if the data was local or not and was a lot faster uploading to the cloud than Carbonite was. At about this point I had 2 of the 4 4 TB drives on my main workstation with 8 TB drives and was having to move stuff around to make space so a RAID seemed to make sense. After a bit of research I decided on the Drobo 5n which supported putting all sizes of drives (which I had loads of laying about). Another selling point was it said it ran Crashplan native although this turned out to no longer be true when I bought it. I went with the n (NAS) version instead of the USB version thinking this would give me more options. Given that Crashplan supported backing up a network mapped drive this seemed to work fine for awhile. Then the year of adventure started. 2017 saw a lot of services start cutting features, support and or jacking prices. While already dealing with site hosting changes Google Drive where I had about 1.5 TB of stuff uploaded (technically it was more like 3 to 4 TB but Google does not count most of it) decided when my free 1 TB offer ran out (which gave me 2 TB not the 1 TB I already had free for a year) they would not let me pay for it. My options were remove stuff down to, a counted, 1 TB of data or pay for 10 TB (at 10 times the price). So I started moving stuff to Amazon Drive. which was half the price of Google Drive for unlimited space. Downside was the Amazon Drive interface is REALLY bad. Plus sharing is limited and it does not seem to support versioning like Google Drive does. Odrive helps make it usable but has its own costs. Then Amazon decided they were they dropping from unlimited to 1 TB for the $60/yr price. Then Crashplan announced it was dropping their Home plan meaning you had to start paying per computer and only supporting backing up network mapped drives if you paid by the TB. 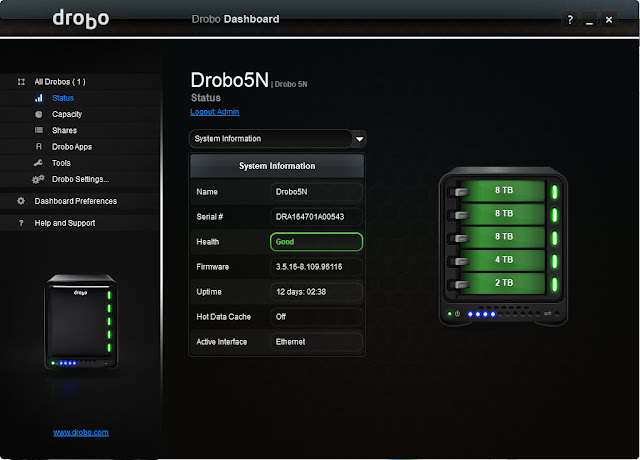 (This is where getting the Drobo 5n over the 5c, USB version came back to haunt me.) At a minimum this was going to increase my cost 5 fold. While updating my backup research I started having connection issues with the Linux server I was backing up to and the Drobo was running out of space. So I babied the Linux server Crashplan connection to the PC doing the Drobo backup for several days. (Remember it turned out Crashplan did not actually run on the 5n model.) I finally got the drive backed up to the Linux box so I had a full backup. Then I swapped out the smallest drive, a 2 TB, for an 8 TB and waited for the rebuild to finish. But it seems I should have checked the logs first because one of the 4 TB drives had dropped offline a couple times and if did it again during the rebuild which corrupted the whole Drobo. I should note here though not actually an issue the Drobo had been telling my I needed to update the software even though the software was already at the version it was telling me to upgrade to. Anyway now I'm panicking since a good bit of the data is is raw video from concerts that is only on the Drobo and the Linux backup and the Drobo is now toast AND the Linux box is getting iffy. 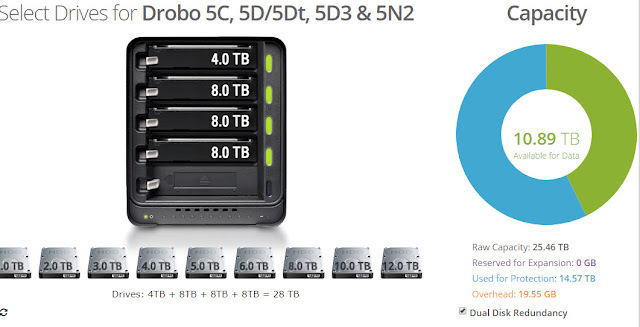 So I ordered a Synology 12 bay NAS DiskStation DS2415+ (Diskless) plus 4 8 TB drives. The main difference between SHR and SHR-2 is the SHR-2 allows 2 drives to die at the same time and still be able to recover versus only one with SHR. The plan is to run it in SHR-2 mode so I can use unmatched size drives and handle 2 drives failing at the same time. This way I can start with the 4 8TBs and then move over the 4 4 TB drives from the Linux server. From what I had read this seemed doable. Turns out it is not. While SHR lets you add anything, SHR-2 only lets you add drives to a volume (RAID) larger than the smallest already in the volume. Plus adding a drive larger than the smallest is treated like the smallest drive in the volume. (Note according to what I'm reading if you add 2 of the larger drives it will start to use all of the drives again. The calculator seems to say you need 4.) So for instance if you have a 4 TB and 3 8 TBs you get the same space as 4 4 TBs. With SHR that gets you 20 TB of space after overhead but only 8 TB with SHR-2. Swapping that 4 out with an 8 TB gets you 24 TB with SHR and 16 TB with SHR-2. 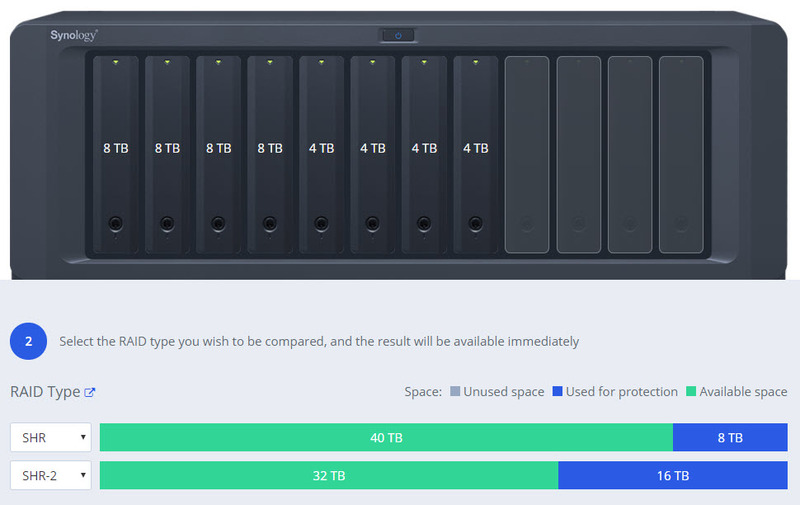 The confusing bit is the Synology online calculator shows if you start with those 4 8s and add a 4 TB you get 28 and 20 TB but you can't actually do that with SHR-2. 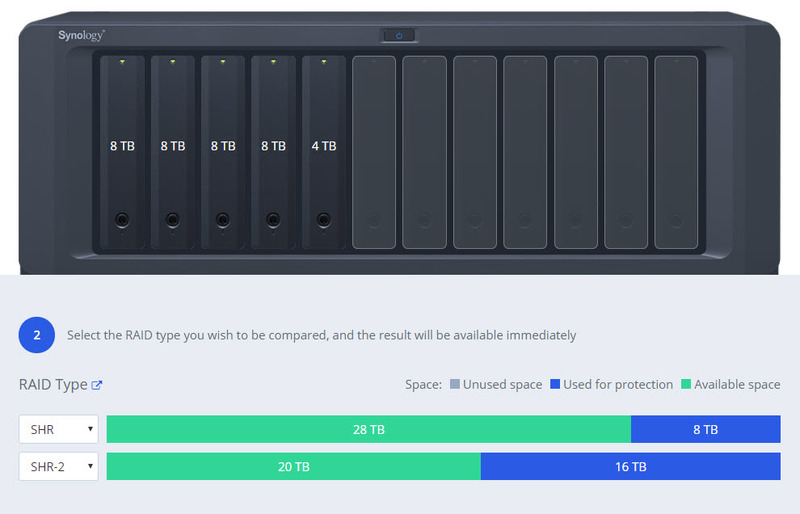 What you can do is start with a 4 TB and 4 8s and you still get 28 TB in SHR but only 16 TB with SHR-2. 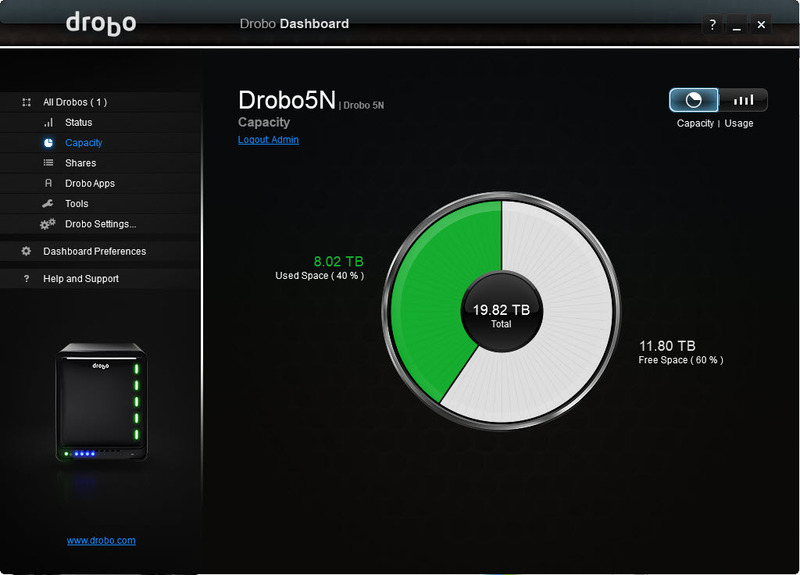 Oddly the Drobo calculator appears to split the difference. Presumably they are miss reporting "reserved" space as protection space since Protections space is larger than available. 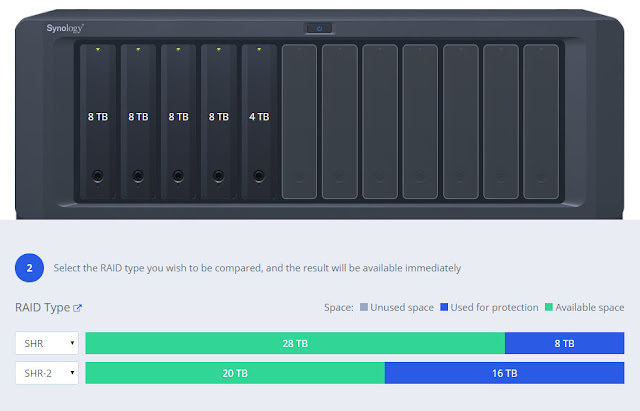 For a 5 bay NAS the Drobos will run you a bit less $400-$500 than the one model 5 bay NAS Synology at $790 though there are 2 and 4 bay Synology version that as a bit cheaper. However for around $800 you can get an 8 bay NAS from either and for $1333 you can get a 12 bay Synology. What you get on top of the extra bays is extra Ethernet ports (2 with the 8 bay and 4 with the 12 bay) allowing the NAS to talk to multiple networks and or aggregate ports to get higher throughput so it can handle more things talking to it at a once. 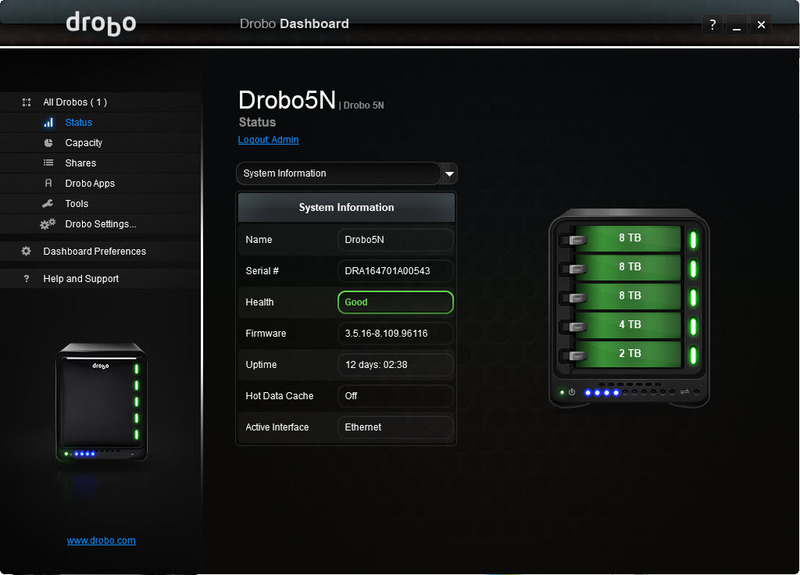 Drobo makes you install an app on a PC to configure and otherwise control your Drobos. And it is pretty simple. As noted about above it was having issues with the 3.15 version not seeing it had been updated. Synology on the other hand you access via a built in web server that looks like GUI desktop. It should be noted too from Windows explorer Drobo shows you the theoretical max size volume NOT the actual size and available space of the volume. Synology shows you correct info. Of course shares are basically folders in a volume so each share shows the space reported for the volume. After checking out a lot of options I was about to buy a Drobo 5c so I could go with Backblaze without having to pay per TB when someone told me how they had unlimited space on Google Drive. Seems if you have a business account with Google (aka G Suite), which costs the same per month per user as 1 TB of Google Drive space, you get 1 TB of Google Drive space per user (shared between users till you have 5 users, at which point it goes unlimited). So now I can buy as many TBs as I want, no 1 to 10 TB jump AND if even if I get as high as 20 TB it will cost half the 10 TB Google Drive cost. Plus you get more features like shared private drive separate from users private drive space where they can share with outside users. Plus Synology as an app called Cloud Sync which lets you sync your cloud services with the NAS. So now it makes sense to move everything to Google. Note for some odd reason when linking Cloud Sync to a Google Drive account you need to use a browser OTHER THAN Chrome. This is a known bug. 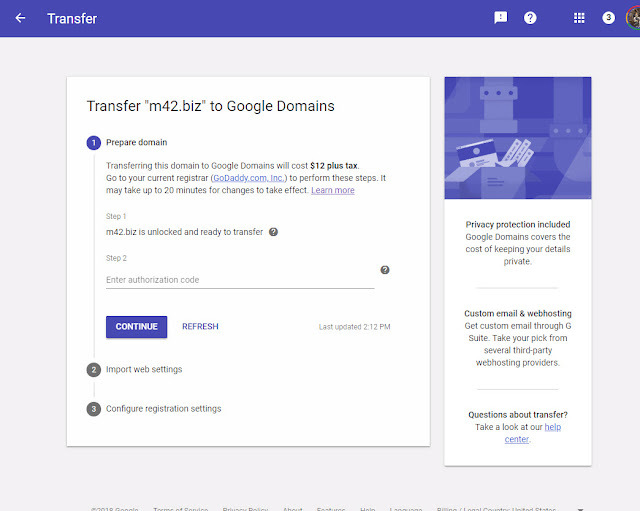 You can also link multiple Google accounts allowing you sync to the the various drive spaces of your G Suite users. You can also encrypt the data uploaded to Google if you are worried about someone getting a hold of it. Coupling this with Odrive lets me do something as wild as syncing triggered snaps from the security camera servers to Google Drive via Odrive while automatically removing them locally after a day to make viewing the triggered snaps easier and reduce used space. On the Synology side you can tell it to sync all but the camera snaps. If you have a folder owned by account A and shared with B, B can "make a copy" of that folder but B does not own any files in the resulting folder. However if B uploads to that folder they do own that new file and that new file is shared with the everyone the original folder was shared with. 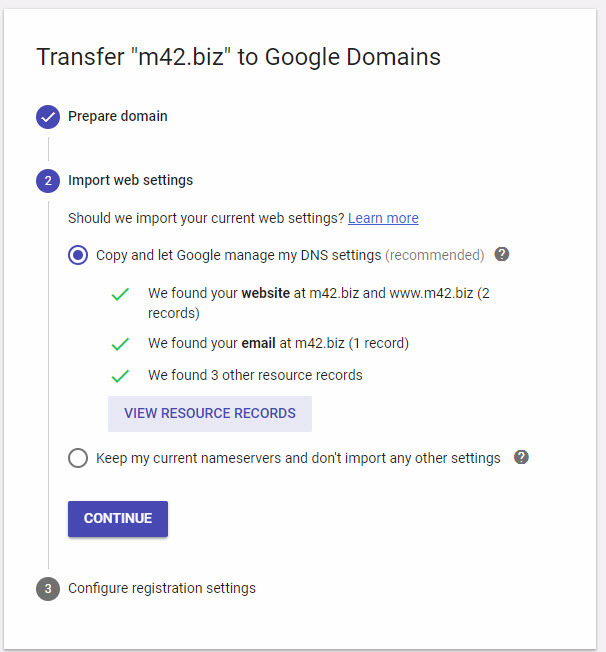 You can not change the owner of the files or folders to your new account unless they both use an email address in the same domain which would seem impossible if you are moving from end user account to business account since the business account requires a domain owned by you while the end user accounts are gmail based. Moving the files from the folder owned by A to one owned by B does NOT change their owner either even though it warns you that the files will no longer be available to the people they were shared with and it actually seems to be copying the files, not moving them, as in it takes a while to move them. You will also need to reshare all the folders and files if you want the same people to see them again like they were in user A's folders. After doing the above I found video files in User A's Google Photos folder though somewhat hidden since clicking on that folder in the web interface (without Photo app open) takes you to the Photos app where videos do not show. Using left nav you can get to the Photos sub folders and see the files. However these seem to be raw video files that should not even be there. 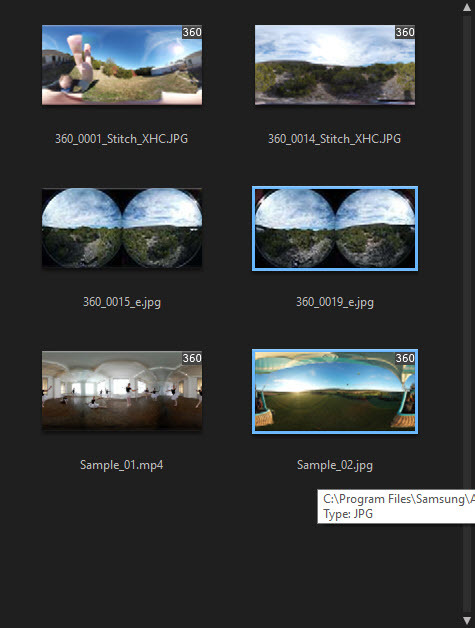 If you remove the above video files from the Photo folders you get pop ups telling you people are loosing access and they are in the trash but when you look at the Trash folder online they are not there. Even after all the above the files still count against user A's storage total even though they are only visible from user B's account. You will need to remove them from users B's folders too before user A gets anymore space made available. So the only way that works to move files between end user and business accounts seems to be to download them local and then upload them again as user B. This is in fact what Google support tells you despite most of the other methods above were posted by people as workarounds. Kind of insane way to move TBs of files between folders on Google servers. And can take forever depending on your upload speed. Over 3 months to upload 1 TB over a 1Mb/s upload connection. Fortunately I have 20 Mbp/s so it should only take about a month. Note if you are thinking, like I was, you could avoid having to reshare everything by just having B upload the downloaded files to user B's "copy" of the original folder that does not seem to work either because when you upload the file it appears to act as a restore reassigning the owner to user A. You need to start with a new folder owned by B and have B upload to it then reshare all the folders A originally had them shared to. A major pain. I finally decide when they dropped the price to $150 to give it a shot. My main thought was to get a scanner that worked more reliably than the Wand. Unfortunately so far the scanner appears to be rather useless For example I tried scanning some cheese and buns. Twice each with the Wand. Though is said "I'm having trouble understanding right now you can see they pretty much made it. The show scanned them easily but then just said it could not find a product matching the UPC. I then tried a TP-Link Smart Plug (HS100) I had just received from Amazon and it found that. So I'm guessing it only works with stuff Amazon carries making it worthless for my use of adding stuff to a shopping list. I was hoping I would have more options of what to display on the screen as well. Basically the default screen saver shows the time temperature and cycles between headlines and suggestions of things to try. There are other screen savers but from the reviews they seem to have music which can only be silenced by turning all the audio off. So more like setting a video on loop than a real screen saver. For short list of the skills written for the Show look here. Otherwise seems to sound and does voice recognition as well as the full sized Echo. So far there really does not seem to be much the Show does that needs the screen. Note there does appear to be a browser buried down in the Show. For how to get at it and used see How to Access the Amazon Echo Show's Hidden Web Browser While using it is probably more trouble than it is worth it does mean some useful skills maybe coming soon that utilize it. Try to upgrade my tablet online since the batter is about shot. AT&T appears to have a 10 inch tablet I can upgrade to for about the cost of upgrading the battery in my old tablet but I can not get the order to go thru. keeps telling me my address fields are not filled in even though they clearly are. Decide to just go into the store. Confirm on website my local store has the tablet and drive into town to get it only to find they do not have them. I start thinking the website might just not work with Chrome and try other browsers. I get order to go through with IE. Get another email saying the order is pending but should arrive no later than 9/27. Call in and rep says I will have it before Friday. Told if not then I'm cancelling or sending back if comes after. Tablet order STILL says should arrive no later than 9/27. Finally had to call in and cancel order then had to go thru 3 reps to cancel tablet line. They also managed to cancel my main line locking me out of the website as well. Took a couple hours to get that back. After that I looked for another carrier. T-Mobile has a deal for those over 55 that was half what AT&T was (2 unlimited lines for $60 + $10 for each tablet) so I decided to move my phones to T-Mobile after 16 years with Cingular / AT&T. Got to T-mobile store and got switched over after having to call AT&T and scream at the rep that he was not going to talk me out of switching at this point. Except I had to leave with 2 locked phones because to unlock your phones AT&T requires you to fill out form online and then wait for an email to confirm the request and then wait again for a second email with a link to get the code. Second email said it could take up to 2 business days! Second line still had a couple months on contract. They tell me I can't unlock it till I pay off early termination fees but can't do that till after next statement comes out EVEN IF I CALL IN! I'll need to call back after the 13th. And I couldn't login because their site is keyed to the main phone number which is no longer on the account. So I ended up having to buy a phone for second line to keep it online to a phone. And I worried over just what kind of nightmare final bill would come that would need sorting. BTW being an Cingular transfer my account ID does not work with the AT&T system. It starts wit a 7 which seems to be invalid. So now my phone number is not on AT&T when I call in I have to keep saying representative till I can talk to a person. Get email to unlock Note 4 and it works so I have 2 phones again. Decide to put tablet SIM in my old Note 8 till figure out what tablet I want to replace it. It tells me it is locked and under contract so can't be unlocked. Get even more worried about final AT&T bill. AT&T has major outage so thinking that is why my Note 4's signal is so weak. My Note 4 (main line) signal has been mostly bad the last week+ at house though my new LG K20 I bought to replace the HTC I can not unlock seems to have plenty of signal. Thinking this is why I can not route its vmail to Google Voice. While I was in town I tried to route vmail to Google Voice one last time but it still says servers not responding. Feeling like AT&T must be messing around so I decided to check out the LG V30 people have been raving about. Could be the Note 4 decided to go bad when I swapped the SIM but seemed less likely at that point. Tried T-mobile site again and still can not register as prime user on account. Call in and rep says problem is a known site issue since 10/8! Ask about LG V30 price. Higher than I was wanting to pay but they are giving away a tablet with it so I go ahead and order the bundle. Seems I had to electronically sign an agreement for them to ship though which I thought might be a problem with the website being broken. Turned out it was 2 docs. First (tablet) went through fine. Second (phone) got the same error as the website but seems to have gone through OK given I got a conformation email. Called AT&T and they STILL can not give me a final bill and rep said their was an early termination fee pending on the tablet. He is supposed to have cancelled that after seeing the upgrade did not go through. He also thought an installment on my HTC would be added later. One bright spot he told me the user ID on the account so I could get logged onto the site again and pay off the account. From looking at the bill online this month's bill includes the HTC pay off. I paid it off now to wait a couple business days and try to unlock stuff again. LG tablet arrived but no phone. Checked the web site and says "Estimated to ship 10/20/2017 - 10/23/2017"
Getting ready to call T-Mobile to ask when phone will ship and see phone order is canceled. My card was declined on the phone order and that is why it was cancelled. It sounds like they tried to charge $800 one time charge for phone but also that $0 was due at ship but he can't tell me which it was. Guy keeps saying to call my bank when I ask how to get them to ship the phone. Finally just ask for his manager. Went though the whole mess again with the manager. Manager could not seem to figure out what happened and passed up to next level. While waiting on hold for the next level the manager calls me on cell lines to tell me we got disconnected. I tell her I'm still on hold. The $42.40 is for the tablet. The phone charge should have be about $80. Oddly she says my email is right email but at yahoo. No idea how that happened. If we reorder the phone the "get the tablet free" promotion should still work. But now seems to involve getting a text with a code that has to be entered in a web page. The phone should be coming now within 2 business days (assuming they have any in stock which there seemed to be a bit of uncertainty about). I'm now on my account as the prime person but with the wrong SSN. Seems the sales guy put it in wrong. (Or if got messed by one of the many reps.) Unclear if that is why the website was not working but rep on 10/20 call said support ticket was filed for that form not working back on 10/8. All total about 90 minutes on the call. I thought I'd try unlocking my Note 8 one last time before setting up my new LG tablet but of course it STILL says it is under contract and can not be unlocked. Just for the hell of it I submitted one for the HTC which looks like it might go through. BTW I found this info on how to unlock various AT&T phones many even without a sim installed. HTC however requires a sim from another network to unlock it. Fortunately I have the sim the gave me for the Note 8 I can stick in there if the email with the code comes. Got the HTC unlocked finally. Only took 19 days. OK maybe if I'd worked on it every day I could have got it done quicker but still this is crazy. V30 shipped late on 10/27. Looks like it will be delivered Monday (10/30). Saw had voice mail on Note 4. Called and had to setup voice mail. Weird call on many levels. Not showing in logs, came in at 11:40 PM and almost a minute of silence. Guessing some sort of automated thing. Tried forwarding vmail to Google Voice again but still getting no response from server error. Will try again after switched to V30. Got the V30 setup. Just moved the SIM over from the Note 4 and told Google to do its thing then just had to login the apps I needed today. Guess what, the voice mail forwards just fine when the SIM is in the V30. And the V30 shows 4 bars off the amp while the Note 4 is only showing up to 2 on the amp. 1 to 0 off. Speedtest shows about 16 down and 2 up. OK not great but I was getting 10 down and 3 up with the Note 4 on AT&T's network when the Note 4 was getting 2 to 3 bars. On my WiFi of course I'm getting around 75 down and 20 up so that is still the way to go. Since it was errand day I drove into the T-Mobile store to show them my Social Security card per their request on the 10/26 call. Got to the store and they had no idea how to do this so they called in. Rep then told them I needed a utility bill with my address on it on top of my Social Security card AND driver's license. At which point I basically told them they were insane. I've opened $35K lines of credit with less! As far as anyone can tell me the ONLY reason I'd need the right SSN on my account (just the last 4 actually) is to get me setup as the primary user on the account which I already managed to do by screaming at reps for an hour the other day on the phone. At this point I'm just going to let is slide. If they shutdown my phones I'll just move over to another carrier again. Or just decide I don't need a cell phone. Got an email from Google Voice that my LG K20 number needed verification to keep it as my voice mail for that phone. Should be simple but it seems the Name ID app that comes on the phone was blocking the call it makes to your phone to verify it is yours. I tried to turn off the filtering but is said I did not have permission because of the whole primary use mess I thought I had sorted. Finally had to kill the app to get around it. Doubly odd when the Name ID app is supposed to be a $4/month add on service which I do not have according to my online account info. BTW I logged into my T-Mobile account just fine and can find no place to sort the permission issue.